This document lays out what we expect from attendees as members of that community. It borrows from both the PyCon Code of Conduct and the O’Reilly Media Code of Conduct. FWD50 is an event for networking, learning, and collaboration among digital government professionals, members of the public service, and the private sector from around the world. Every participant brings value to the event, and we want all attendees to have an enjoyable and fulfilling experience. Accordingly, all attendees are expected to show respect and courtesy to other attendees throughout the conference and at all conference events, whether part of the core FWD50 conference, its workshops, offsite events, or related events that happen during the week of the event. To make clear what is expected, all delegates/attendees, speakers, vendors, organizers and volunteers at any FWD50 event are required to conform to the following Code of Conduct. Organizers will enforce this code throughout the event. At FWD50, we assume that most people are intelligent and well-intended, and we’re not inclined to tell people what to do. However, we’ve recently come to see that sometimes it’s necessary to spell out the behaviour we support and don’t support at conferences. The core of our approach is this: we will do whatever we believe is necessary to ensure that FWD50 is a safe and productive environment for everyone. One issue that has come up at some technical conferences is sexual or racist comments or images in slides. This is not appropriate. Speakers and exhibitors should use good judgment; if we hear complaints and we think they are warranted, you may not be invited back. Even more alarmingly, we’ve heard accounts of female attendees having to put up with stalking, offensive comments, and unwanted sexual advances. We’d like to borrow a line from the Flickr Community Guidelines, which use the term Creepiness as follows: “You know the guy. Don’t be that guy.” If we hear that you are “that guy” (regardless of your gender), we will investigate and take any action we feel is appropriate, including asking you to leave. Please bring any concerns to the immediate attention of the event staff, or contact Phil Telio (phil@startupfest.com) or Pamela Perrotti (pamela@startupfest.com). This event is for everyone. FWD50 is dedicated to providing a harassment-free conference experience for everyone, regardless of gender, sexual orientation, disability, physical appearance, body size, race, or religion. Communicate appropriately. All communication should be appropriate for a professional audience including people of many different backgrounds. Sexual language and imagery is not appropriate for any conference venue, including talks. Be kind to others. Do not insult or put down other attendees. Behave professionally. Remember that harassment and sexist, racist, or exclusionary jokes are not appropriate for FWD50. Or else. Attendees violating these rules may be asked to leave the conference at the sole discretion of the conference organizers. Harassment includes offensive verbal comments related to gender, sexual orientation, disability, physical appearance, body size, race, religion, sexual images in public spaces, deliberate intimidation, stalking, following, harassing photography or recording, sustained disruption of talks or other events, inappropriate physical contact, public shaming, and unwelcome sexual attention. Harassment also includes public shaming, both as provocation and as retaliation; this Code of Conduct outlines ways of dealing with problems that may arise and these should be how problems are escalated. Exhibitors and sponsors are also subject to the anti-harassment policy. In particular, exhibitors should not use sexualized images, activities, or other material. Be careful in the words that you choose. Remember that sexist, racist, and other exclusionary jokes can be offensive to those around you. Excessive swearing and offensive jokes are not appropriate for FWD50. If you are being harassed, notice that someone else is being harassed, or have any other concerns, please contact a member of conference staff. 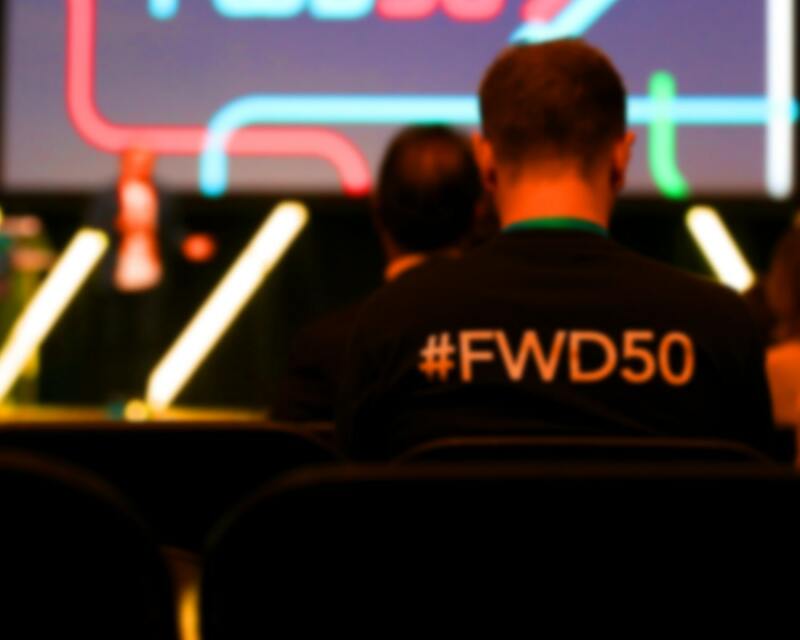 Conference staff will be wearing “FWD50” badges and distinctive T-shirts. Conference staff will do what is necessary to help participants contact venue security or local law enforcement, provide escorts, or otherwise assist those experiencing harassment to feel safe for the duration of the conference. We value your attendance. These procedures have been adopted from the Ada Initiative’s guide titled “Conference anti-harassment/Responding to Reports”. 1. Keep in mind that all conference staff will be clearly marked as staff, wearing shirts and badges and in some cases using radios to communicate. The staff will also be prepared to handle the incident. All of our staff are informed of the code of conduct policy and guide for handling harassment at the conference. 2. Report the harassment incident (preferably in writing) to a conference staff member. All reports are confidential. Be sure to have a good understanding of our Code of Conduct policy, and attendee instructions for handling harassment, which can be found on the FWD50 website. Give accused attendees a place to appeal to if there is one, but in the meantime the report stands. Do not encourage an apology from the harasser. It is very important how we deal with the incident publicly. Our policy is to make sure that everyone aware of the initial incident is also made aware that it is not according to policy and that official action has been taken—while still respecting the privacy of individual attendees. When speaking to individuals (those who are aware of the incident, but were not involved with the incident) about the incident it is a good idea to keep the details out. If at all possible, reports should be made to Phil Telio +1(514)909-9709 or Pamela Perrotti +1(514)816-8124.